Soar down the burial shafts of ancient tombs. Get up close to artifacts uncovered by one of the world’s first scientific archaeologists. Unveil the mysteries of the Pyramids through visual storytelling, much like the Egyptians themselves. These are just some of the ways students in the Gen Ed class "Pyramid Schemes: The Archaeological History of Ancient Egypt" are exploring the cemeteries of the famous Giza Pyramids, just west of modern Cairo. Dating to the third millennium BCE, the site contains thousands of tombs, temples, art masterpieces, and artifacts. The course is designed and led by Professor Peter Der Manuelian, Harvard’s first professor of Egyptology since the days of George A. Reisner 1889, whose scholarship and excavations between 1905 and 1942 along the banks of the Nile helped to define modern archaeological methods. Hear from the professor and his students how this course pushes the boundaries of traditional teaching through a blend of visits to classic museum collections, 3D computer modeling, and GIS resources. And see how students are using video to grapple with the enigmas of this ancient civilization and its influence on our lives today. Peter Der Manuelian has led a 10-year effort to digitize materials from a complex of tombs, temples, and ancient artifacts surrounding Egypt's famous Giza pyramids. Ancient Egypt is a subject with a built-in fascination factor. The remote antiquity of this complex civilization, the soaring pyramids, cryptic language of hieroglyphs, detailed mortuary reliefs, and sweeping historical drama across the ancient Middle East, all make the land of the pharaohs instantly appealing. In addition to more traditional illustrated lectures, I try in Societies of the World 38 ("Pyramid Schemes: The Archaeological History of Ancient Egypt") to bring ancient Egypt to life with the help of new technologies and field trips. The resources at Harvard, and in the Boston area, are simply too rich to ignore. Students have the opportunity to handle 5,000-year-old artifacts in the storage collections at the Peabody Museum. And during trips to the Egyptian galleries at the Museum of Fine Arts, Boston, we visit many of the greatest masterpieces of Egyptian art, all excavated between 1905 and 1947 by the Harvard University-Boston Museum of Fine Arts Expedition. 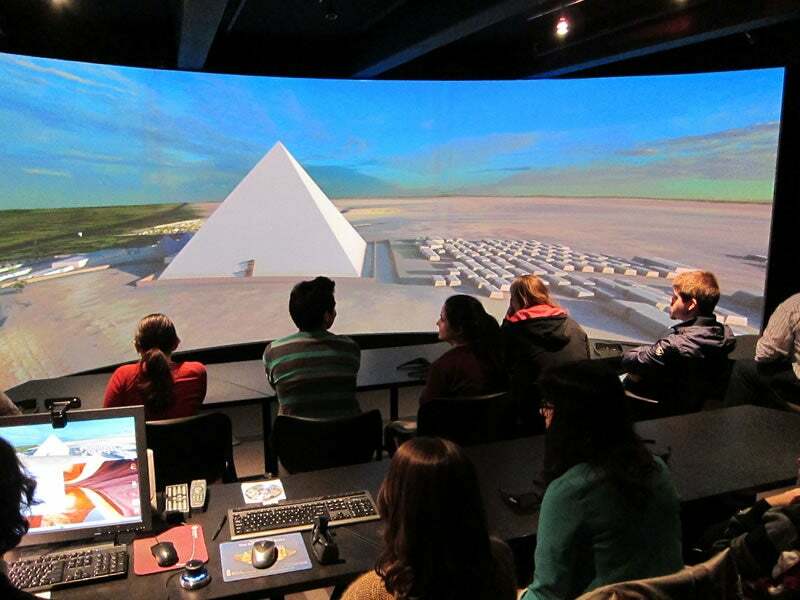 In the case of the famous Pyramids of Giza (2500 BCE), we "transport" students to the site virtually, using Harvard's Visualization Center, a giant curved screen that projects our real-time computer models of the pyramids, temples, and surrounding tombs in interactive 3D. We can witness royal funerary ceremonies, complete with animated avatars; dive down a burial shaft that no one has viewed since its original excavation back in 1906; or explore the decorated wall reliefs and inscriptions in colorful tomb chapels. Statues and other objects, now in museum collections around the world, are restored to their original findspots. 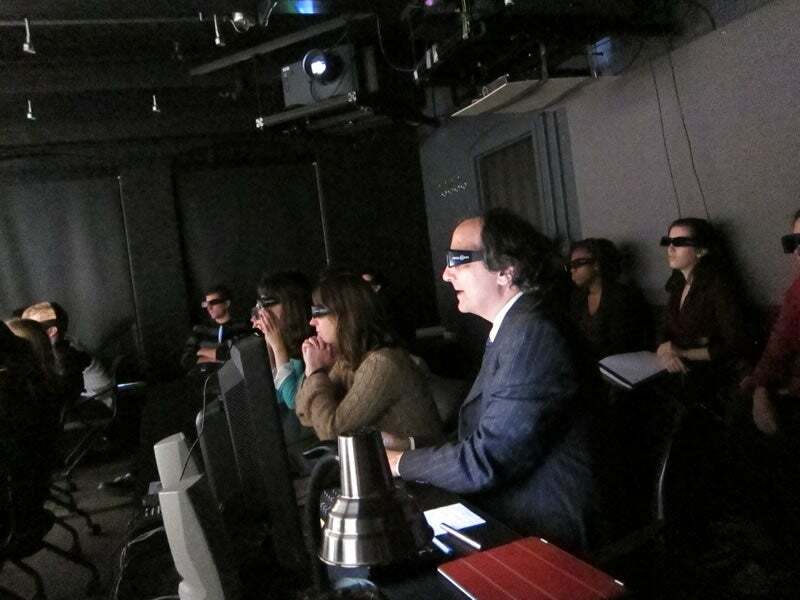 Thanks in part to our productive partnership with Dassault Systèmes in Paris, archaeological context comes alive in an immersive and interactive environment that is pushing the boundaries of scholarship and teaching in new directions. Read more about Professor Manuelian’s class and work and what he sees for the future of archaeology. Drawn to the course by an Egyptian art history course while abroad, Maggie was intrigued by the course trailer and decided to give it a try. What’s the best part of the course? The technology turned out to be one of the best features of the class. For example, the 3D tour of Giza in the Visualization Center gave us an understanding of how all the monuments and tombs relate to each other physically that photos simply cannot provide. Students in Pyramid Schemes are able to interact with Ancient Egypt in a much more physical way as well. 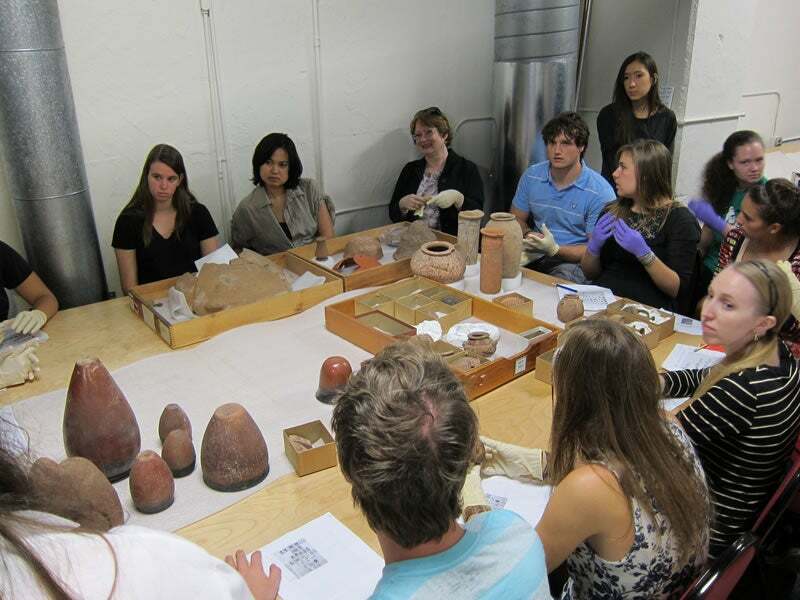 When sections visited the Peabody Museum’s storage, we were able to hold examples of pottery we had seen in lecture. During our trip to the MFA we took a tour of the Egyptian exhibit with our professor, who is intimately familiar with the collection, and saw “in person” a lot of artifacts we had already studied. 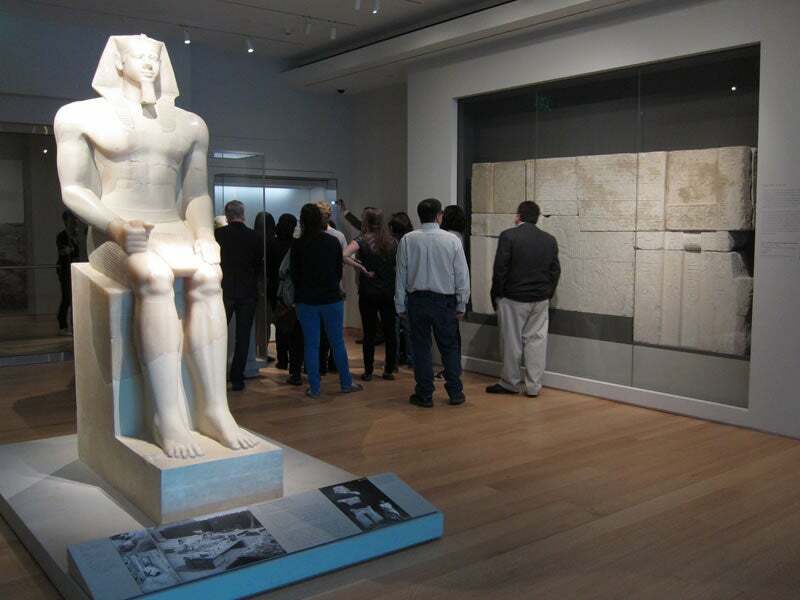 The combination of technology and access to actual artifacts gives students a deeper understanding of Ancient Egyptian culture and makes Pyramid Schemes a unique and enriching class. The iMovie assignments are another way for students to use technology to engage with the material in a different way. In order to make my iMovie about artistic conventions from Predynastic Egypt through the Old Kingdom, I had to choose which artifacts among the many examples we saw in lecture that I could use to support my argument (and fit into the allotted two minutes) and decide how to use them in an interesting way that would engage the viewer without being distracting. For Fydrych, Pyramid Schemes is “an in-depth interaction with the past” that fulfills a childhood dream of studying the monuments and leaders of Ancient Egypt. 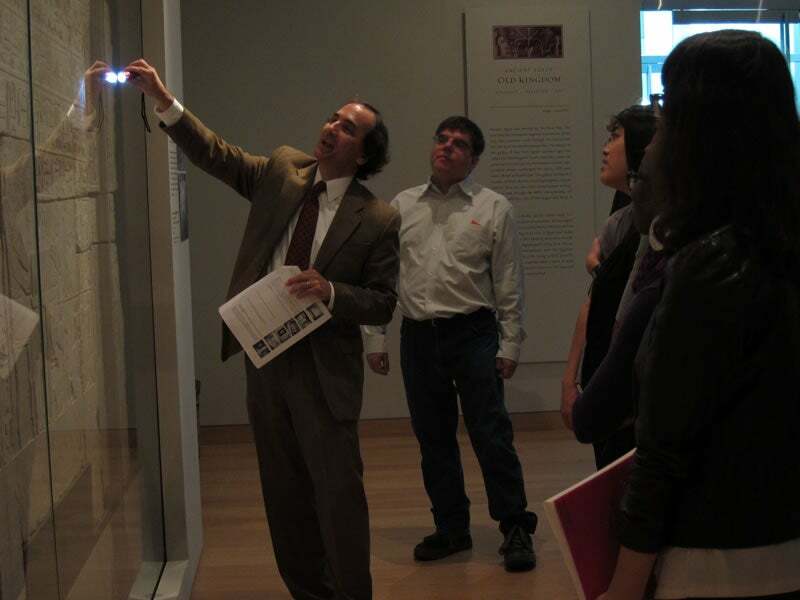 Whether I’m examining pre-historic black-topped red-ware (which is nearly 6,000 years old) in the annex of the Peabody Museum or exploring Giza virtually in the Visualization Center, the course has never ceased to provide me with a hands-on approach to learning. Reading about pre-historic Egypt and its people’s pottery is one thing, but seeing and physically experiencing their work is something infinitely more incredible. I can create media, see tangible artifacts in both the MFA and the Peabody Museum, and even experience Ancient Egypt in 3D. This class has allowed me to study topics that genuinely interest me and to do more than just read about them in a book. My short iMovie focuses on the controversy surrounding the construction of the Great Sphinx. My interests in Ancient Egypt primarily focus on Giza and the various monuments and tombs there, and that was exactly what I got to produce for class. Yang describes himself as a “terrible history student” who nevertheless was drawn to Ancient Egyptian history and art. He credits much of his newfound interest to Professor Manuelian’s enthusiasm and clear passion for Ancient Egypt, as revealed through his charismatic lecturing style. My favorite (though nauseating!) experience in the class thus far was walking around the Great Pyramid field of Giza in the Visualization Center; being given the ability to “walk” into and “explore” the pyramids and tombs of Egyptian rulers was such a sensation, only later to be able to touch and see with my own eyes the objects we studied from lecture slides during our visits to the MFA and Peabody Annex. The interactive nature of this course’s section classes renewed my understanding of learning as I was forced out of my textbooks and into a reality preserved by generations of archaeologists. And so, just as I was first enthusiastically directed to this course by a friend, I would wholeheartedly point people to it with all the more fervor. I would also highly recommend that all persons of any academic discipline explore the fascinating topic that is Ancient Egypt with an open and curious eye to see the things that a two-hour James Bond movie could not quite capture. My iMovie is a brief overview of how Egyptian art changed from the beginnings of the civilization to the end of the time period we've studied, which is around the Middle Kingdom, although some examples were used from the Late Kingdom as well. The video attempts to demonstrate how the development of art correlated with the evolution of kingship. Why did Cody take the class? He says, “Pyramids. Mummies. Pharaohs. What’s cooler than that? In what other class can a man actually study Tutankhamen, hold in his hands Ancient Egyptian artifacts, study with an amazing and jovial professor who’d be as keen and able to write lecture notes in hieroglyphs as English, and witness the bygone land of the pharaohs in 3D? I’ve read books on Ancient Egypt since I was a boy; I’ve seen the pyramids and sailed the Nile. Professor Manuelian showed our class the Giza necropolis and the inner workings of the great pyramids in 3D with the Visualization Center. I was awestruck—I was able to see into the eyes of the men whose lives had amazed me since I was young. Any class can offer students a world in books—Pyramid Schemes actually showed me a world of which I otherwise could have only dreamt. The experience in the Peabody Museum was surreal; I held in my hands three thousand-year old pottery that I had read about in our book and seen in an earlier lecture. We were able to compare the pottery styles of different pre-dynastic Egyptian cultures and those of the Nubians to the south with actual artifacts. Our experience in the Peabody was sentimental, too, because some of the pottery was recovered by Harvard’s own Dr. George Reisner. Later, we saw more of the work of Harvard’s legacy at the MFA. Apart from the huge statues and wonderful artwork we saw in the museum, I stood within inches of artifacts recovered from the tomb that I wrote about for my iMovie assignment. Aliens did not build the pyramids. But seriously, I am constantly reminded of the modern world when I look at the Ancient Egyptians! I would not have guessed beforehand, but studying 3,000-year-old ruins has allowed me to look at the parallels between the Ancient Egyptian world and my own in ways I would have never dreamed. The Egyptians had the same political issues, religious conflicts, famines and economic troubles, and personal traits and dreams that I see in people and cultures today. Professor Manuelian has accomplished the unimaginable task of condensing four millennia into one semester while covering all the necessary themes and without sacrificing any of the juicy details.